2.3 White Helmets Covering Up Genocidal Massacres? 5 Independent video or photo material? 8 Soros Says to Shave? 12 When did the White Helmets first appear in Syria? The White Helmets claim to be a civil defense force specializing in digging up victims from bombed out buildings. They may in fact be a US State Department funded infowar operation for intervention and a war of aggression in the name of a "No-Fly Zone" to protect civilians. Their website looks like it came out of some smart New York or London Advertising Agency. In fact it did. It's an obvious branding exercise using the iconic white helmet as the easy to remember visual key. According to a spreadsheet I've acquired they got a just under $1 million from Oak foundation for non Syrian related 'activist' marketing. Given the number of high-power Team members I'd expect income of the order of $5 million annually from probably(?) Soros related funds. More research shows they have a portfolio of topics they market - LGBT, Climate Change, and Syria being the major ones. Various 'empowerment' and 'women' topics pop up but don't seem to be mainstream. The best guess is they are a niche marketing agency who focus on profitable topics especially ones that can get a strong US/European consumer reaction. Hence the inevitable donate button on their various websites. However it's virtually certain they get the majority of their funding from 'interested parties' who may or may not be traceable to various Nation States. As for White Helmets? I'd say that is a complete creation of Purpose They may have bought in some Syrian Activists and written them up as local heroes, but the evidence is they started seriously marketing them around 2014-08-11T19:50:31Z (When Alison Weiner registered the domain name). The Syrian Civil Defense, a group of 2,640 volunteers that provides emergency and rescue services in rebel-held and contested areas, has been gathering evidence to document the recent attacks, said Farouq Habib, the group's political adviser. He and the group's director, Raed Saleh, returned this week from the United States, where they met U.S. and European officials. They collected remains from the barrels used in a number of bombings, soil samples that the group says show high levels of chlorine traces and urine and blood samples from victims. Is civil defense the same volunteer rescue team this guy the article starts with is a member of? "With only a cloth mask for protection, Firas Kayali rushed to try to rescue the residents of a house" that wound up being where the Haj Ali home in Mishmishan from the May 2 alleged incident. "Once a house painter and now a member in a volunteer rescue team," Kayyali tried three times to "break in" to the (locked?) house but the gas - chlorine, allegedly - caused him to suddenly loose consciousness - which chlorine doesn't do. No one else on his team had gas masks either, so they had to wait 20 minutes for the gas to dissipate before they could get in and find the baby already dead. From something that doesn't sound like chlorine, although they'll say it smelled just like it. About Those Chlorine Gas Attacks in Syria Humanitarians for War, part 2. By Rick Sterling, founding member of Syria Solidarity Movement (and ACLOS site member). Counterpunch, April 3, 2015. 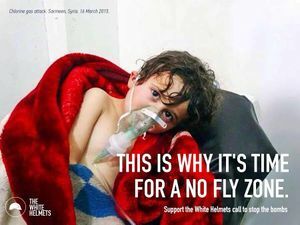 The fake “independence and neutrality” of White Helmets is shown by their active promotion of a No Fly Zone. I came across this tweet which contains a youtube video showing the execution of a civilian by some masked goon after some older guy read him his verdict. Tweet says he's an alleged murderer. After he gets killed with two headshots, three "white helmets" come along with a stretcher and carry him away. Way to save lifes. Anyway, what surprised me was that they had fancy uniforms with that blue-yellow logo. Never seen those before in the few videos I watched about the chlorine stuff and "white helmets" dancing with Nusra in Idlib. So I thought they were new and wanted to find out how new. So I went to the linked account @whitehelmetsbot (which is what it say it is, a bot), checked the timeline and quickly found this announcing new graduations last week. That "Mayday Rescue" org has a not very informative, anonymously registered website and says it is in Dubai. Notice the similarities of their logo with SCD logo. I also found that the account @SyriaCivilDef now wears the name "The White Helmets". The distinct uniforms go back as long as you can scroll on Mayday Rescue and I quickly figured that "White Helmets" is another name for Syrian Civil Defense. Fortunately one could scroll just back to early August 2014 which is when as Charles found the White Helmet domain was registered. And indeed, the first occurance of "White Helmets" is in three tweets from August 29 with pics from the same graphics designer, the second of which is this, which says that Mustafa was "trained with support from @jica_direct by @ARKSyria and @AKUTEnstitusu". In 2013, with help from Turkey's elite natural-disasters response team, AKUT, and $300,000 of seed funding from Japan, the U.K., and the U.S., (Le Mesurier, CE) launched the first seven-day SCD course to teach 25 vetted Syrians how to deal with the chaos erupting around them. Around the same time (early 2013, CE), ARK, an international contracting firm based in Istanbul, had received a mix of U.S. and British funding intended for “non-lethal aid” to the Syrian opposition, and had identified the rescue teams as a priority. The scale of Assad’s bombardment paralleled conventional wars in Europe (lol, CE), and ARK resurrected a Blitz-era doctrine called Civil Defense. Partnering with a Turkish organization, AKUT, that specialized in earthquake response, they established a training center in southern Turkey for the new teams. There, the boys from Hanano learned basic urban search-and-rescue techniques, along with first aid and firefighting. They were issued trucks, uniforms, and equipment, and then sent back to Syria. Now, aside from the propaganda value of especially the second article, these seem to be legitimate organizations (@jica_direct is a Japanese rescue org). So what I take from all that is 1) the "White Helmets" are a slick branding/marketing/propaganda campaign started in August 2014 based on an existing organization that might be legitimate, and 2) our chlorine propagandists might only "play" "White Helmets" and use their logo in the videos, and nobody complains because the goals are the same. On 5th May 2015, the Hreitan Civil Defence team were contacted around 11:15am by the Dar al Qadaa in Hreitan and informed that there was a corpse in the street, in front the Hreitan Main Mosque. The Civil Defence team deployed a corpse retrieval section which arrived at the location at approximately 11:35am. When the section arrived at the scene they found an execution in the process of being conducted, which was carried out at approximately 11:40 am. Independent video or photo material? Has anyone ever seen the White Helmets on video or photos other than the ones they produce themselves? They were quick on the spot of the al-Nusra execution, but has anyone else actually filmed them? Are there any independent sources for their existence? April 18, 2016, SCD/WH leader Raed Saleh arrives in US for a humanitarian award, is told to leave, his visa is not valid. No reason is given. A bit later, France 24 reports, Spokesman Mark Toner "would not say why, earlier this month, US officials had barred the volunteer group's leader ... Toner said US law prevents him from discussing individual visa cases, but seemed to suggest that security considerations could have been in play. "Broadly speaking ... on any visa case, we are constantly looking at new information," he said. "And if we do have new information that we believe this individual ... would pose a security risk, we'll certainly act on that." He would not say if Saleh is under suspicion, but added "any individual in any group suspected of ties or relations with extremist groups, or that we had believed to be a security threat to the United States, we would act accordingly." Is this just because they operate in Islamist-rebel controlled areas, repeat all their talking points, wave their flags, helpc clean-up and cover-up their crimes, etc. ? That wouldn't make much sense. Hm, I could reach for a couple reasons, but fair point, and let's save space. It is a compelling thing to say though, when they decide what to say. Except ... do you respond to a travel ban by saying 'travel back, or to wherever?' Or do you detain? And if on some terror list, you detain, right? I don't know, really. The White Helmets leader, Raed Saleh has just been deported from the US where White Helmet backers USAID [US Government] were about to present him with an award. The US State Department have stated possible connections to "extremist organisations" as the reason. The White Helmets are internationally recognised for their rescue efforts, and have been nominated for the "real" Nobel Peace Prize, which will be announced in October. This video by Morris 108 was published yesterday. It shows a computer screen running a CCTV recording of the attack dated October 30, 2016. The bomb is real, but the victims are fake. This is, so no White Helmets. But similar hoax methods. From a Shia area of Bahgdad: "Hurriya"
White Helmets turn up in Venezuela. When did the White Helmets first appear in Syria? My understanding is that White Helmets were formed in late 2013. 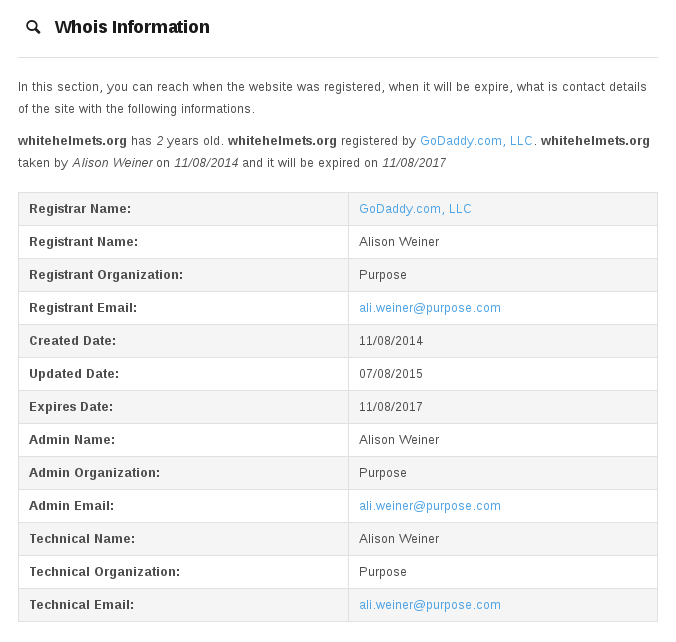 Alison Weiner registered the domain name whitehelmets.org on 2014-08-11T19:50:31Z. Turkish created Violet Organisation, aka Violet Syria, has been present in Ghouta at least for this last winter. It appears to have been created in competition with, or even replacement of, the White Helmets. Almost predictably there is a British link with David Milliband in the management structure. Notable names / sponsors include the Asfari Foundation (also funds White Helmets), Qatar Red Crescent, International Rescue Committee, plus a bunch of others I don't recognise. This page was last edited on 17 March 2019, at 15:29.